The two airline brands share many similarities. Which is the better buy for the long-term investor? Some investors may see in this chart a buying opportunity, which raises a related question: Which of the two mammoth airlines is the better buy? It turns out that Delta and American share many similarities, from annual revenue levels to operating characteristics. So bear with me as I run through a series of tables in order to isolate meaningful differences, and thus gain a holistic perspective about which runway your investment dollars should land on. Data source: SEC filings, YCharts. All dollar figures in billions. "TTM" = Trailing 12 Months. The key takeaway in this first table is that, despite nearly identical revenue, Delta enjoys higher operating income than American. In the last 12 months, American showed greater net profit, but this was a function of a $3.0 billion net income tax benefit that the company realized when it reversed a deferred tax asset allowance in December of 2015. Both companies wring handsome operating cash out of revenue, especially as they function in an extremely capital-intensive industry. Delta, however, has generated $1.5 billion more in operating cash during the last 12 months. Data source: SEC filings, YCharts. Balance sheet metrics for both companies as of 6/30/2016. All dollar figures in billions. "TTM" = Trailing 12 Months. As expressed by the current ratio, American could boast of being slightly more liquid than Delta at the end of the second quarter. On the other hand, the long-term debt held by American is nearly triple that of Delta's, pushing its debt-to-equity ratio to nearly nine times Delta's metric. And when we calculate long-term debt to net property and equipment, we see that American has more than twice Delta's indebtedness against airplanes and other equipment. Delta's higher solvency is also indicated by "times interest earned," a measure of how many times over a company's EBIT (earnings before interest and taxes) the company can cover the interest on its debt. In fact, Delta has assiduously reduced its debt over the last several years, securing an investment-grade rating from Moody's credit-rating agency in February of this year. A final note in this section: Both companies carry rather sizable retirement obligations to past and present employees. When I read an airline's balance sheet, I like to add retirement liabilities to long-term debt to get a clearer picture of the major liabilities that a carrier is on the hook for. Using data from the table above, Delta's debt plus retirement obligations comes to more than $20 billion, while American's hovers around $30 billion. Both Delta and American pay a modest dividend to shareholders. And both have purchased a significant amount of their own shares over the last 12 months. But American's $6.2 billion buyback splurge within a year bears some responsibility for the aggressive borrowing discussed above. Neither airline is exactly on fire from a valuation standpoint. At less than seven times forward earnings, both carriers will likely be considered cheap by many a bargain hunter. Note that the market appears to be placing a premium on Delta's forward earnings growth potential versus American's, as seen in the PEG ratio. Data source: SEC filings, YCharts, planespotters.net (for average fleet age). Metrics for both companies drawn from Q2 2016, ended 6/30/2016. American's passenger-revenue-per-available-seat-mile (PRASM) deficit was offset partially by its greater revenue passenger miles during the quarter. While the two airlines have similar cost-per-available-seat-mile (CASM) profiles, American still seems to lag Delta in operating margin each quarter. This is due to a higher general and administrative expense on its profit and loss statement, which can be traced, in part, to its noticeably larger employee count. Finally, Delta maintains a much older fleet than American Airlines, and most other legacy carriers, for that matter. Delta's long-held emphasis on using well-maintained, but older, planes is changing, however. During the second quarter of 2016, Delta placed orders for 37 Airbus A321ceo aircraft, and 75 C-series planes from Bombardier, at a total list price of nearly $10 billion. Of course, the prices Delta will finally record on delivery should be substantially discounted from list, as is industry practice. Having run through the tables above, we can conclude that Delta holds three key advantages over American Airlines. First, it's more efficient operationally. Except for a period of three quarters from late 2014 through mid-2015, when Delta recorded significant mark-to-market adjustments on its fuel hedges, the company has produced consistently higher operating margins than American over the last five years. Second, Delta is also more efficient with its capital. A determination to minimize debt and win its investment-grade rating means that the company's fleet expansion can be financed at a lower cost. 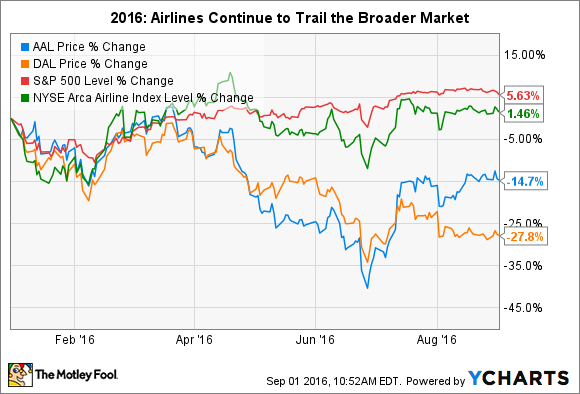 More importantly, Delta is better positioned to weather a cyclical downturn in the airline sector due to its more modest leverage. Last, and related to the first two factors, Delta produces highly impressive operating cash flow, better than even American's fine-tuned ability to wrench cash from operations. This allows it more flexibility in making capital decisions, and provides room for ample future share buybacks. None of these factors alone illuminates Delta as being clearly superior to American Airlines. Both brands are vast and well-run enterprises. But as the business quarters add up, Delta's combined modest advantages over its worthy competitor should reward the patient investor with a higher multiple of earnings for Delta stock.